If you are looking for ways to make money online and if you can spend 1-2 hours daily then paid online surveys are the best way to earn $200 to $1000 (up to Rs 50000) per month. There are number of best online survey sites where you can signup & earn $1 to $20 for completing each & every online survey. Online Survey Jobs: How to Get Paid? First I will explain you about the concept of online surveys in brief and then I will show you some of the best survey sites where you can get online survey jobs. MNC’s (multinational companies) want to grow their business by increasing the sale of their products. They can do this if they know the exact taste of the people they want in any product. By taking the feedback from the people through online surveys, they can create a new product or improve the existing products. This way they will create a product which has great demand in the market. What do they Ask in the Online Survey? You will be asked very general questions in these surveys. In some questions, you need to select ‘YES’ or ‘NO’ and in some survey, you need to choose one options from 4-5 options. Basically they ask about your age, family background, education, lifestyle, your location etc. and your opinion for different products. It’s easy & fun to complete a paid online survey? You will get many surveys from MNCs or other big companies for different products & services and you can get paid $1 to $20 or even more for spending your time to complete such surveys. MNC’s hire market research companies (also known as online survey sites) to conduct online surveys for their products & services. These market research companies have millions of members in their database who are ready to complete surveys for these MNCs. But completing these surveys takes time so these members get paid from $1 to $20 for completing each survey depending on the length of the survey. You can become member with such online survey sites, complete surveys on regular basis & make regular monthly income. You can check the list of top 20 survey sites from the list below. Just visit the sites & signup to start earning from online survey jobs. If you are from USA then you can check these 21 paid survey sites exclusively for USA where you can earn $1000 cash per month working part time. One of the best & most popular survey companies. You can make a great income from this single site only. I have earned more than $80,000 (Rs 55 Lacs) from this single website. Is not that great if you can make even 10% of this income? One of the best thing about ClixSense is that you can complete paid surveys of many companies at 1 platform. 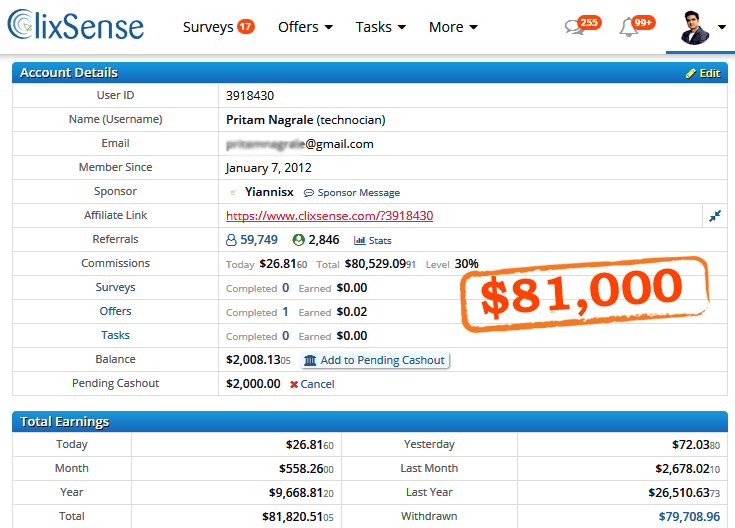 There are a number of other ways like completing offers and tasks that can give you more income from ClixSense. You can find a complete guide to work on ClixSense on MoneyConnexion. One of the biggest site that offer survey jobs and many other ways to make money. Neobux is more a PTC site and paid survey is just one of the way to make money. I have written a complete Neobux strategy that will help you to earn $20 per day from Neobux. You can make money by viewing ads, completing surveys, working mini jobs & even playing games. Many people make full time income by working on just these sites ClixSense and Neobux. One of the oldest and best online survey sites available for international members. You can get paid up to $5 for each survey. Paid more than $32 millions to the worldwide members. Earn MarketPoints for completing surveys and then redeem for rewards or cash from PayPal. Join GlobalTestMarket Now & win a chance to earn $2000 cash. Swagbucks is another best company where you will get regular surveys. Apart from Surveys, you can also earn money by shopping online, searching web and watching videos. You can redeem your points to for gift cards from Amazon or request cash from PayPal. You will also get $5 as signup bonus. It depends on number of factors like your country, your education, your marital status & others. You can receive minimum 20-50 surveys in a month, if you join all the 20 sites from the link provided above. How Much Money I can Earn from Online Surveys? You can earn Rs.10,000 to Rs.20,000 which depends on your profile, how many survey sites you join & how many surveys you complete every month. You can also check this list of best PTC sites where you can earn additional Rs.5000-10,000 per month by just viewing the ads. If you are looking for more better ways to earn money online then you can go back & check the list of online jobs to find more better option. How do I Receive My Earning? Most of the companies send your income in your PayPal account. PayPal.com is free to join where you can add your bank account & receive money from PayPal to any of your bank account in India. You can see above link of PTC sites where we have provided details on PayPal. So this way you can earn money from online survey jobs. You can click the above link for top 20 survey sites & start earning from paid online surveys. Previous articleEvent Management – Booming Career to Watch out for! Is there a online survey companies in Europe, cause i cant work for USA companies? I think it is very easy way to earn money for ladies. It’s good and ambitious looking forward to work with you. Am in Holland how can I get online job thank you. Hi there, I am from south Africa, I am currently studying i.t part time. I am interested in doing online surveys to fund my courses and make an income as I have no other income in my home. I am looking after my very sick mother on her pension fund. It would be greatly appreciated if someone could point me in the right direction in signing up with any survey companies. Im from South Africa, i wanna know how cn i join the online jobs n earn money 4 my family , since im currently unemployed. Is Any Of This Online Surveys Available In South Africa, I Would Really Like To Do This, It’s Exactly What I’ve Been Looking For. Very Informative n helpful site for begineers n part time online job Workers There is no Investment & you can easily work n earn good….. I am so glad I found this site. Thank you for sharing the tips and these sites. I appreciate your concern for others and hereby thank you for taking the patience to offer assistance to people like me. I will take my time to go through the sites and earn extra income. im really looking forward to spending an hour or two online and earn even a bit. i am a teenage who is studying pre medical in kota and i believe that one should be self dependent from an age as such itself. i have the gadgets required for the job, and i think ill work out just fine. looking forward for the job. i have a time to do online surveys job,i use a Samsung j2 android phone,I am intrested in this job,let me know how can i abe to do this job and earn extra income,& thanks for giving us to earn extra income through online survey. Can the payment for on line survey job be made through cheque. CAN I LINK MY SBI ACCOUNT WITH PAYPAL? Shall I do from Bangladesh ? Iam from nigeria is there any online survey jobs for nigerians? I am interested. Kindly respond. Thank you. This job are girls it is better option to make money online because it is easy . Am Waridah from Uganda I want to start online surveys but am only seeing options for India, what should i do? All options given were for those in US, what of other country Nigeria in particular.